With a name that could easily describe a Tiger Woods Asian vacation (I should stop with the TW jokes...), I wasn't expecting too much from 24/7 Thai. After all, how can one get good Thai food at 2:00am in the morning? 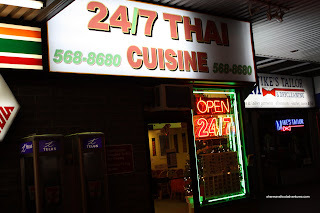 Actually, it used to be open 24/7; but I can only assume that Thai food ain't too popular between 4:00am to 9:00am. For Polka King and myself, it was something a bit different in terms of late night eats. After all, we've been doing the wonton noodle thing quite often and honestly, it's quite boring. Located in the same plaza as 7-11 on the corner of Oak & Broadway, this little Thai restaurant doesn't look too promising from the outside. Inside, it's quite minimalistic other than random attempts at decor. Naturally, at 2:00am in the morning, there is only one server (which actually didn't seem like enough). When we finally got her attention, I ordered the Shrimp Pad Thai and Prawn Red Curry. When the pad thai arrived, I immediately noticed they used a rice noodle that was a bit thinner than what I'm normally used to. Despite this, they managed to cook it perfectly so it was still chewy. I thought it was flavourful with plenty of tamarind flavour. I only wished it had a bit more spice since I found it a bit too sweet. The red curry was acceptable. It had a mild amount of spice (well, for me at least) and plenty of prawns. 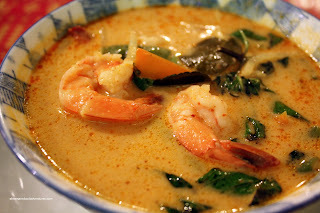 Other prominent flavours were coconut milk and Thai basil. Too bad I didn't order any rice! I was too full from the noodles to eat any rice. I ended up packing up nearly the whole thing. 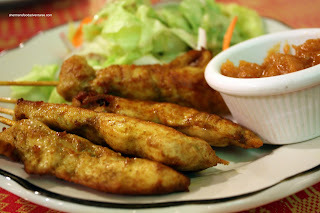 Polka King wasn't all that hungry and decided to try the Chicken Satay. The skewers were meaty; yet lacked any real flavour. The satay dip was quite sweet with lots of peanuts. Ultimately, the dish ended up just being sweet or bland if ate without the dip. Well, this is not exactly great Thai food; but it wasn't bad either. Again, at 2:00am in the morning, we really had not much to complain about. Well, there was only one server and she had to do everything. That made it difficult to make any requests or even get the bill. Understandable that they didn't have much more staff present, after all, most people are sleeping at this time, not munching on Thai food. Well, unless you're Tiger, apparently sleeping has a different meaning. i've been looking for a takeout spot that's open late with salad rolls. i think that's what the cold rolls are on their menu but do you happen to know if i'm wrong? 7-eleven next deep is pretty convenient for a late night slurpee too. I guess the good thing is it's cheap??? Trisha, I would assume the rolls are what you're taking about; however, they did have a strange menu. If I make there again soon, I'll let you know. Anson, yah it's cheap and open late. Probably the best things going for it. I'm glad the 'hole in the wall' appearance didn't stop me from trying this place. It was delicious! Pretty decent for late night eats. No other place serves Thai food @ 3:00am!